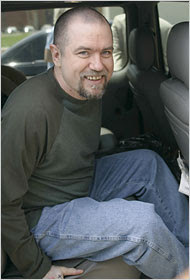 On Thursday, April 24, I picked up Curtis McCarty from the Knoxville airport. We locked eyes as he passed through the security checkpoint and he flashed me a peace sign. As we shook hands, I tensed up–Curtis McCarty spent nearly 19 years on Oklahoma’s death row for a crime he didn’t commit. Would we talk about anything other than death row? Would we talk about death row at all? Would we have anything in common? As we walked to the car, Curtis and I spoke of our mutual fondness for the Stone Temple Pilots and Rage Against the Machine and our disdain for text messaging and pop music. I told Curtis that we’d have some time to relax before our speaking engagement at the University of Tennessee Knoxville Law School. He grinned. “If there’s anything I know how to do, it’s killing time.” The weather was pleasant so I gave Curtis a walking tour of the UT Campus. Students were out and about playing frisbee, volleyball, and baseball. I only graduated from college eleven months ago, so this was a familiar sight. Curtis’s educational experience was different. He completed junior high, but dropped out of high school. While on death row, Curtis kept up with his studies in science and technology and educated himself on the laws dictating his life. When he speaks, its quickly apparent that he’s deeply intelligent. His words are chosen carefully. It’s almost as if he speaks with the belief that every sentence could be his last. Before Curtis was to speak at the law school, I told him that there would be attorneys, law professors, and students in the audience. This was an important event for TCASK; we’re always looking to build relationships with schools. The room filled to almost 70 people. It was a Thursday evening in the midst of final exams. Curtis began by immediately taking responsibility for ending up on death row. He shamefully recounted the juvenile history of drugs and crime which led him to associate with the murdered individual. To Curtis, his poor choices prior to his incarceration played a large role in his ending up in prison. Yet, the state of Oklahoma is ultimately responsible for sending an innocent man to death row. The case of Curtis McCarty is riddled with problems that suggest he was wrongfully convicted in the murder of Pam Willis: suppressed evidence, destroyed evidence, and perjured testimony. Curtis spoke about his case with the knowledge and eloquence of a law professor. The students were impressed; some said Curtis knew more about death penalty law than they did, and were eager to bring him back for the UT Law Review Death Penalty Symposium next year. The next day I took Curtis to speak at two assemblies at Knoxville Catholic High School. Again, this was an important event for us: Creating a strong base of Catholic support in Eastern Tennessee has always been a priority for TCASK. This time, Curtis spoke in a manner that suited the ages of his audience. Rather than sifting through the legal problems pervading his case, he focused on the personal story of his life. He shared photos taken at five year intervals when he was on death row. “It’s tough to look at these photos because all I see are missed birthdays, graduations, soccer games, and weddings.” The Principal told me afterwards that he saw specific students that he knew to be drug users hanging onto Curtis’s every word. He said that we need to bring back Curtis every year. He replied, “I was angry, in fact I was very angry. I soon realized though that bitterness is unproductive. I wanted to be productive, and I wanted to seek justice. In order to do this, I had to stop being angry and instead tell my story.” The story of Curtis McCarty is a story that needs to be told, over and over and over again. Fairly, there are numerous aspects you would like to think about medications. All discount medicaments save money, but few online drugstores offer better deals than other online drugstores. There isnвЂ™t anything you canвЂ™t order online anymore. Remedies like Deltasone ordinarily is used to treat diseases such as eye problems. Glucocorticoids naturally occurring steroids, which are easily absorbed from the gastrointestinal tract. There are varied drugs for every conditions. Cialis is a remedy prescribed to treat many illnesses. What do you already know about long term side effects of cialis? What consumers talk about how long does it take for cialis to take effect? A general sexual claim among men is the erectile dysfunction. Sexual problems mostly signal deeper problems: low libido or erectile malfunction can be the symptom a strong soundness problem such as heart trouble. Albeit the erectile disfunction itself isnвЂ™t necessarily dangerous, erectile dysfunction is sometimes one of the early warning symptoms of other underlying soundness conditions that can be extremely dangerous. Unfortunately nearly all over-the-counter medicines have sometimes dangerous aftereffects, from muscle aches to death. If you buy any erectile dysfunction medicaments like Cialis, check with a physician that they are sure to take with your other drugs. Do not take unwanted medications. Take Cialis to your local chemist’s shop which will dispose of them for you. Your gift will help to save lives and move Tennesseans to repeal the death penalty. Copyright © 2019. Tennesseans for Alternatives to the Death Penalty. All Rights Reserved.